Reservation can be done a minimum of 24 hours before the trip start time. Reservation can be done through our website at www.cabsforyou.com or through an email to reservations@cabsforyou.com or by calling us at +91 9999854828. Our representative will email / call and confirm your booking. An advance payment of 15% of the estimated cost of the total trip/package needs to be done by the customer. This deposit amount is based on the tentative fare quote/package cost selected and will be adjusted with the final amount at the end of the trip. Payment of this deposit can be done through Debit/Credit Card. 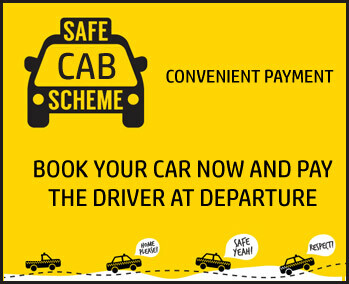 You can also choose to send us the payment through a Cheque/Demand Draft in favour of Cabsforyou.com at our address C - 75 Upkar Apartments, Mayur Vihar Phase 1 Extension, Delhi - 110091 through courier. The customer will get an Email and/or SMS confirmation once the deposit is received (after realisation of Cheque/Demand Draft). The customer will get an Email and/or SMS of details of the cab - cab number, cab driver's name, mobile number 24 hours before the travel date. Customer should carry a printout of the booking voucher or the booking confirmations SMS for Identification. After completion of the trip, the final payment has to be done by the customer to the cab driver itself. The final payment will be the total cost minus the advance payment. The final payment should be cash payment only. A bill for the total amount paid will be sent to the customer on his email or mailed at his/her mailing address. You can modify the end date (shortened) for a booked trip without any charge. You can modify the end date (extend) for a booked trip (subject to availability of the vehicle). A charge of INR300 will be applicable. Changes in the trip start date will require cancellation of the trip and a re-booking, and in that case cancellation charges will be applicable. A charge of INR300 will be applicable. Cancellation requests can be done online or by sending an email at reservations@cabsforyou.com or calling at +91 9999854828. In case the booking is cancelled more than 48 hours before the pick-up time, no penalty will be charged. In case the booking is cancelled 24-48 hours before the pick-up time, 50% of the advance deposit will be deducted as penalty and the rest will be refunded. In case of an accident/vehicle break-down Cabsforyou.com will try to provide an alternate vehicle to continue the journey or bring the customer back to origin.